In our last post, we talked in detail about how certain events like war and societal expectations affect art and jewelry designs. In this post, we have broken down the main points into a comprehensive infographic. 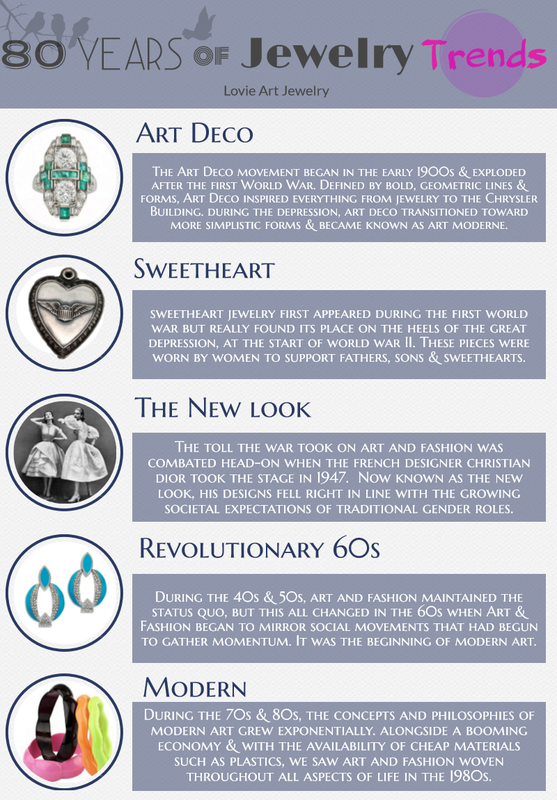 The art deco movement began in the early 1900's and exploded after the First World War. Defined by bold, geometric lines and forms, art deco inspired everything from jewelry to the Chrysler building in New York. During the Depression when resources were less abundant, art deco transitioned toward more simplistic forms and became known as art moderne. Art moderne focused on large curves and long lines that appear aerodynamic (think the Airstream trailer). The style used the basic concepts of art deco but stripped them of their ornamental nature and sharp lines. Sweetheart jewelry first appeared during the First World War, but really found its place on the heels of the Great Depression, at the start of World War II. Sweetheart jewelry pins and pendants were worn by women to support fathers, sons and sweethearts abroad. The toll the Second World War took on art and fashion was combated head-on when the French designer Christian Dior took the stage for the first time in 1947. Using excessive, billowing fabrics, Dior created a line of women's clothing that's now known as the "New Look". His designs complimented the growing societal expectations of traditional gender roles at that time, and the look was heavily embraced. Over the next two decades, fashion and jewelry changed little. But all that changed in the 1960's when art and fashion again began to mirror social movements that had begun to gather momentum. These included the women's rights movements and movements for racial equality. It was the beginning of modern art and modern people. Jewelry became bigger, more colorful and more expressive. Modern industry helped to mass-produce jewelry affordably. During the 70's, the concepts and philosophies of modern art grew exponentially. Alongside a booming economy, and with the availability of cheap materials such as plastics, we saw art and fashion woven throughout all aspects of life by 1980.